The central upright fountain nozzle, also called central water column nozzle, is made by equipping its water distributor with a number of direct-jet nozzles whose directions are different. When the nozzle specifications are the same, the jetted water columns will be strong and straight. When the nozzle specifications are in different types, the water streams will be also strong, but in different levels. It's an essential part of large-scale fountain. As a professional manufacturer of central upright fountain nozzle in China, Guangzhou Water Art Fountain Irrigation Garden Co., Ltd also provide many other water fountains, water features and fountain nozzles for clients around the world, including programmed animated fountain, square fountain, scenic fountain, mist fountain, laser fountain, waterfall rockery, floating fountain, running fountain, wall fountain, waterfall feature, digital water curtain, indoor water fountain, direct jet nozzle, morning glory nozzle, flower fountain jet, dandelion fountain nozzle, rotary nozzle, flat nozzle, fog nozzle, fan nozzle, adjustable nozzle, water sphere and hemisphere nozzle, aerated nozzle, spring nozzle, etc. For all of our products, lifelong maintenance is available. We have built up lifelong cooperative relationship with customers from Malaysia, Brunei, Tajikistan, Saudi Arabia, UAE (United Arab Emirates), and many other countries in Central Asia and Southeast Asia. 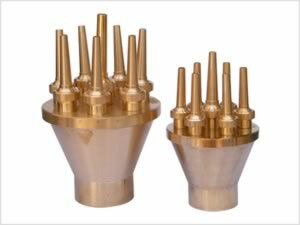 If you need our central water column nozzle, please do not hesitate to contact us. Morning Glory Nozzle The morning glory nozzle, sometimes also referred to as trumpet flower nozzle, is mainly used in fountains built indoors or in courtyards.